Goal number one: just finish. Goal number two: just finish. Goal number three: be physically able to drive myself home after. This time last year, I couldn’t run a mile. Hell, I couldn’t even run a half mile. Over the course of the past 12 months, I’ve managed to get myself to a point where I could regularly run between three and six miles. Not fast, mind you, but I could make it. 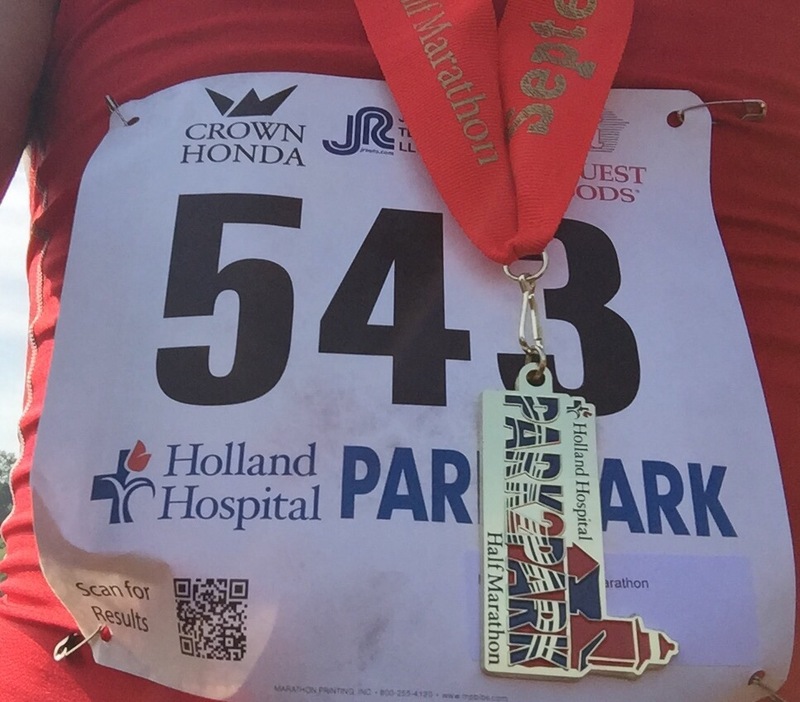 So when someone I used to know invited me to join them at the Park2Park Half Marathon, I took it as an opportunity to challenge myself to make the distance. Again, not fast, but just to make it to the end. I slowly began to increase my distance with each successive run, gradually working my way up from three, to four, to five then six miles. I still needed to take periodic walking breaks, but that was ok. I knew I wouldn’t make the change overnight. I eventually got to a point where I could run a full six miles before needing to walk. It was then, in July, that I decided to take it literally steps farther, and go for a nine mile distance. I was ecstatic to find I COULD make it nine miles if I alternated walking and running after making it through the initial six miles walk-free. This gave me the confidence to try for 12 a couple weeks later. The spirit was willing, but the body was weak. My right leg fell victim to painfull cramps and muscle spasms. Friends in the know suggested some changes to my diet, stretching, and hydration – all of which I heeded – and tried again a week later. I was able to last 12 miles that time before the legs cramps and spasms returned. So, I decided to run “only” three or four miles at a time for a while, and a couple weeks later I gave it another try. Just over a week before the big day, I was finally able to complete a distance of 13 miles without needing to quit completely. I still needed to walk quite a bit, but I was able to go the full distance. The morning of the race, I was sure to get up plenty early to do a TON of stretching, eat a couple of bananas, and drink loads of water – all of which I hoped would keep me from cramping up 3/4 of the way through the race. I got dressed, and headed out on the 45-minute pre-dawn drive to Holland, MI. Even with more traffic than I expected for that early on a Saturday morning, I made it safely and in great time. The start was the usual cattle drive of people rushing forward into a bottleneck, then exploding into the open road beyond. I lagged back, very comfortable in letting everyone sort themselves out before I reached the line. Just ahead of me was the 12-minute group, with the sign-carrying pacer in their midst. All my previous runs averaged in the 14-minute range, so all I wanted to do was keep them in sight, if I could. If not, no biggie. I just wanted to finish, regardless of my time. Sure enough, about three miles in, I noticed I’d lost sight of the sign. I could no longer see the 12-minute group. A part of me was disheartened, but I reminded myself of goals one and two, and trudged on. Five miles went by, and I was doing pretty well – by my standards. I was tired, of course, but had not yet needed to take a walk break. I had also made good use of a water station in an effort to stay hydrated, and stave off cramping that was sure to hit me later. But I wasn’t referring to their repeated passing. I could smell bacon. Strong and clear. Delicious bacon. It smelled glorious. We shared a laugh. I never saw them again. And I didn’t get any bacon. As we neared the 6-mile mark, we entered the state park where the photogenic Holland Lighthouse sits. Having studied the course map thoroughly, I knew this meant I was halfway, and would soon be entering neighborhoods that included some slight hills. The course is pretty flat, overall, but I was beginning to feel some discomfort in my left leg, so even slight hills were something to which I was not looking forward. And sometimes those spectators had cowbells. Two things about bringing cowbells to watch a race. First: don’t underestimate the power of a spectator. Even though I knew zero of the people I saw, it was such a motivator to keep going, and to not give up. It sounds cheesy, but it really did help. And, second: if you’re gonna ring a bell, ring it like you mean it! The group started howling with laughter. “I NEED MORE COWBELL,” they replied, and began to ring with gusto! For the remaining seven miles, I repeated that line each and every time I passed a cowbell. And each and every time, it worked. Each and every time. After seven miles, I began taking short walking breaks. 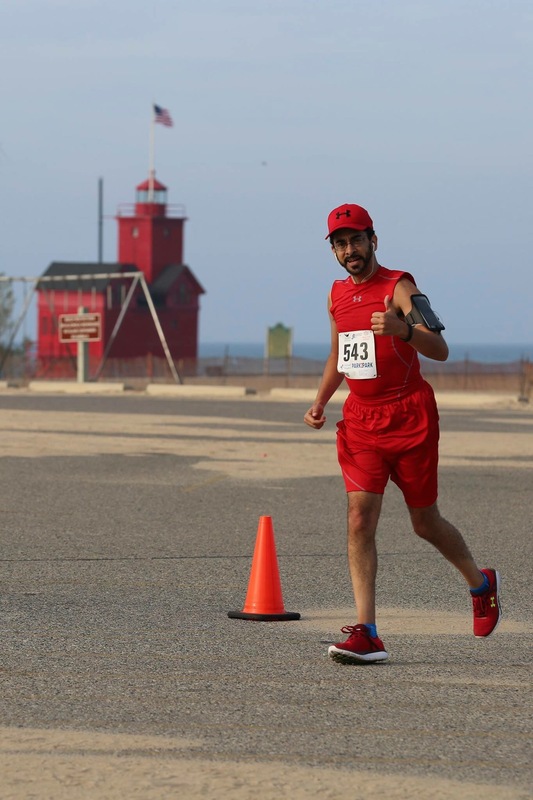 The running app on my phone was telling me I was making great time – again, by my standards – but I didn’t really pay much attention to it since I was pretty sure I had lost signal somewhere near the Lake Michigan shoreline, and the split times were wrong. Had to be. Then, something miraculous happened. There, in the distance, I saw it. Like some beautiful mirage, I could see the sign of the 12-minute pacer, and the small group of runners who had keep up with her. I couldn’t believe it. I’d *never* come close to averaging a 13-minute mile for this distance, much less a 12- minute mile. Yet, here I was, a mere two blocks behind them! I was stunned! I resisted the urge to speed up to catch them, knowing that if I’d already caught up this far, I’d already gone far faster than I likely *should* have, and was increasing my risk of not making the finish. I decided to bide my time, relax, and slow it down a bit. Funny thing, though. As I continued, my pace remained right in the 12:10/mile range for a few more miles. I was FAR exceeding my own expectations. For a little while. My phone app alerted me to the fact I was a mere 1.1 miles from completing my first ever half marathon. I got a tiny jolt of adrenaline. I tried to run again, but could only manage a hundred yards or so before I needed to throttle it back down to a brisk limp/walk. I SO wanted to start running, but knew better. But then I made the turn into the fairgrounds, and knew I was close to home. A chill rose up my spine as I realized I actually WAS going to finish. This time, I felt a rush of adrenaline, and began to jog. With a full limp, I turned onto the racetrack surface, and turned for the finish. 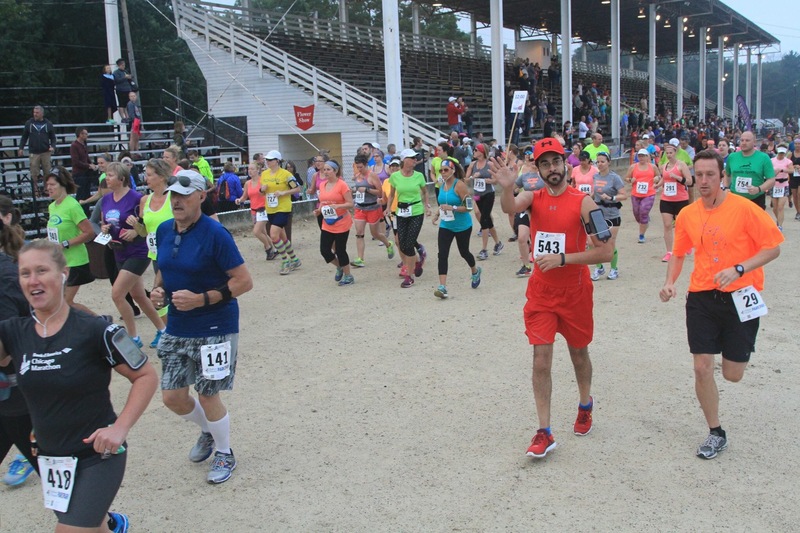 As I strove on, I could hear the cheers of those still in the stands, and imagined they were cheering for me – knowing full well it was a group of onlookers cheering for one of the people I had just passed. I pushed myself onward, and kept sprinting to the finish. Last year, I couldn’t make it one mile. 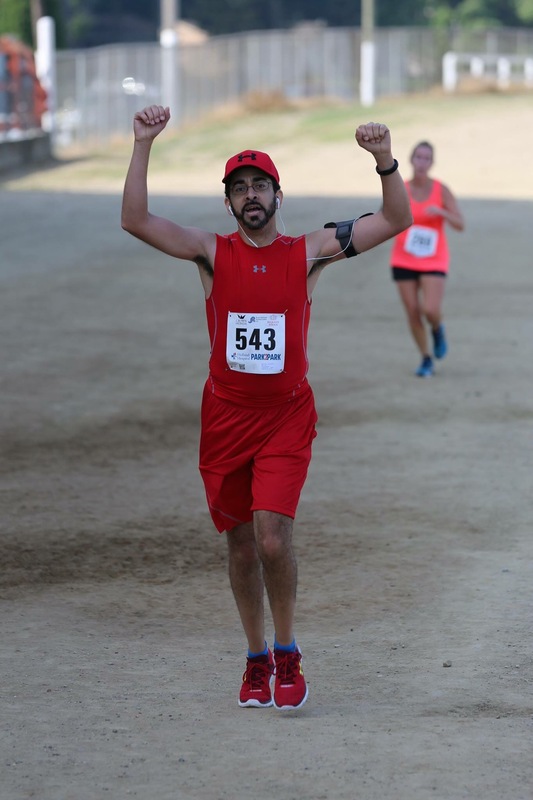 Last month, I finished my first ever half marathon. Even when enduring great pain, we can make our way through that pain in order to reach our goal, and even exceed expectations.